He grabs a handful of jersey with each hand just above his hips and presses his thumbs into the material tightening the jersey on his narrow torso. His eyes wander before his gaze settles on the floor. He absentmindedly twirls his hair with his right hand. His body language seems to suggest he’d rather be anywhere but here. But when play resumes, the nonchalance is shed in an instant. He is reborn the moment the ball touches his hand. He controls a tight dribble on the right elbow and accelerates toward the sideline. In a blip he snaps the ball from right to left, changing course and sending the defender spinning and stumbling. In this newfound daylight he darts for the rim. With his eyes locked on the target, he whips a one-handed, no-look dart to a teammate streaking on the baseline whom no one even saw. 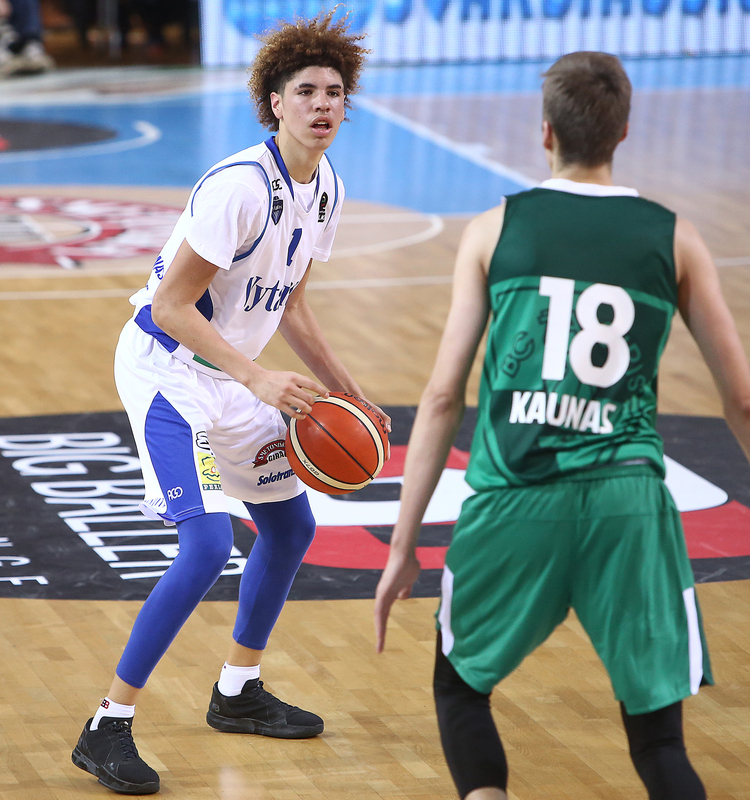 In a small Lithuanian town, the inexplicable basketball career of LaMelo Ball is taking shape against a backdrop of unfamiliarity, boredom, pressure and reality TV cameras. The youngest Ball is on an unorthodox path to the NBA, which represents one of the biggest gambles in amateur basketball history with his father, LaVar Ball, pulling him out of school after he went 65-3 as a starting point guard at Chino Hills High in California. After the 11th grade ended before it started, he was home-schooled and trotted around the globe to be the face of the family’s Big Baller Brand streetwear line, and he now finds himself at a crucial stage in his development 5,900 miles away from home playing for Vytautas Prienai, a middling club in the Lithuania (LKL) Basketball League. His days are spent alongside his 19-year-old brother LiAngelo, the short-lived UCLA guard, practicing and playing against seasoned professionals, some of whom are twice LaMelo’s age. He fends off boredom in his hotel suite at the five-star Vytautas Mineral Spa, where his Instagram remains both a window to the world and a lifeline to his friends a world away. The 6-foot-5 point guard’s learning curve has been steep as he’s struggled to defend bigger, stronger players and dim the green light in his mind to meld with the more team-oriented ball his coach prefers. LaMelo Ball of Vytautas Prienai in action during the match between Vytautas Prienai and Zalgiris Kauno. But the youngest Ball is beginning to find his footing, going for 31 points and five rebounds in a 141-133 loss to VEF Riga Skola on Feb. 25. His confidence soared thanks to five exhibition games against junior-level competition dubbed The Big Baller Brand Challenge in which he put up gaudy numbers, including a 40-point, 11-assist, 10-rebound triple-double. Of course, there’s the familiar LaVar-inspired drama. LaVar has been critical of Seskus, questioning his grasp on the game. He even persuaded him to allow him to coach two BBB Challenge games, implementing a Chino Hills-like, warp-speed offense, but is frustrated at how his sons are being used. The Balls have been well-received in Prienai, a gray, sleepy town of 10,000 people. A local pizza shop named a special after the Ball family and announced they could eat for free. They attended the Lithuanian version of the Grammys, where LaVar presented an award. LaMelo is besieged by autograph seekers often wearing Big Baller Brand apparel, has his own cheering section and routinely fulfills requests to take selfies with opposing players. A photo of the 3 Ball children sit on the kitchen counter. LiAngelo, the middle child, stands on the left. 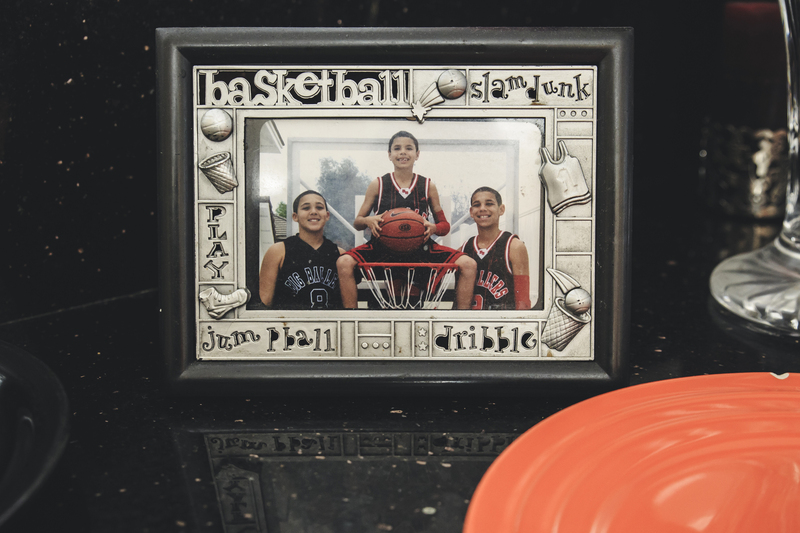 LaMelo, the youngest of all 3 sits in the middle, and Lonzo, the oldest, stands on the right. The first two sons — Lonzo and LiAngelo, born 13 months apart — were strong. When the youngest, LaMelo LaFrance Ball, came home from the hospital in the summer of 2001, he had to fight to keep up. His mother, Tina, wouldn’t let him go. But LaVar was hardest on the smallest one. The one who was most like him. He gave him his own room. It was the bedroom closest to his and Tina’s. He had to keep it clean. Keep up with your brothers. Don’t cry. Speak up. If you want to go potty, learn yourself. But something happened that the loud man did not expect: The boy would shine. He did not flinch. He was not scared. He was loud too. LaVar would start training Melo Dip — that’s what he called him — soon after he could walk. He committed to UCLA 11 years after that. LaMelo is now the youngest American professional basketball player ever. He’s the first 16-year-old with a signature shoe, the Melo Ball 1. He’s got fans with MVP pedigree in the Golden State Warriors’ Stephen Curry and Kevin Durant, two of his favorite players. He drives a Lamborghini, has his own clothing line and is drawing interest from sponsors such as energy drink Red Bull. Then there’s his own emoji complete with braces, eyebrow lines and his rebellious floppy hairdo. Thanks to his star turn as the comedic, mischief-prone wonder boy on his family’s reality show, Facebook-based Ball in the Family, he’s become one of the most recognizable teenagers in America. LaMelo has more Instagram followers (increasingly the currency of fame) than all but nine NBA players and three NBA teams. His 3.6 million admirers are more than the population of Lithuania. His fame, burgeoning but hardly solidified, is not yet a burden, and he often seems as if he is hardly aware of it. Change never arrives or leaves quietly. Sometimes it is jarring and frightening. Sometimes it doesn’t go as planned. Sometimes it’s streamed on Facebook. Sometimes at the center is a 16-year-old kid. This is the extraordinary life of LaMelo Ball. LaMelo touched snow for the first time despite being woefully underdressed — he didn’t own any winter clothes — for a New York snowstorm in December 2017. He pelted LiAngelo with raggedy balls of wet, white powder in front of their boutique hotel, shrieking with glee all the while. The Big Baller Brand pop-up shop — part pep rally, part bazaar — had raked in tens of thousands of dollars, riled a blocks-long line of teens indoctrinated on their reality show (and their parents with disposable income) and spawned a half-dozen viral videos in the space of four hours. He and LiAngelo dropped $3,200 at a chic clothing store on, among other things, a pair of Instagram-worthy red, spike-covered skate shoes. 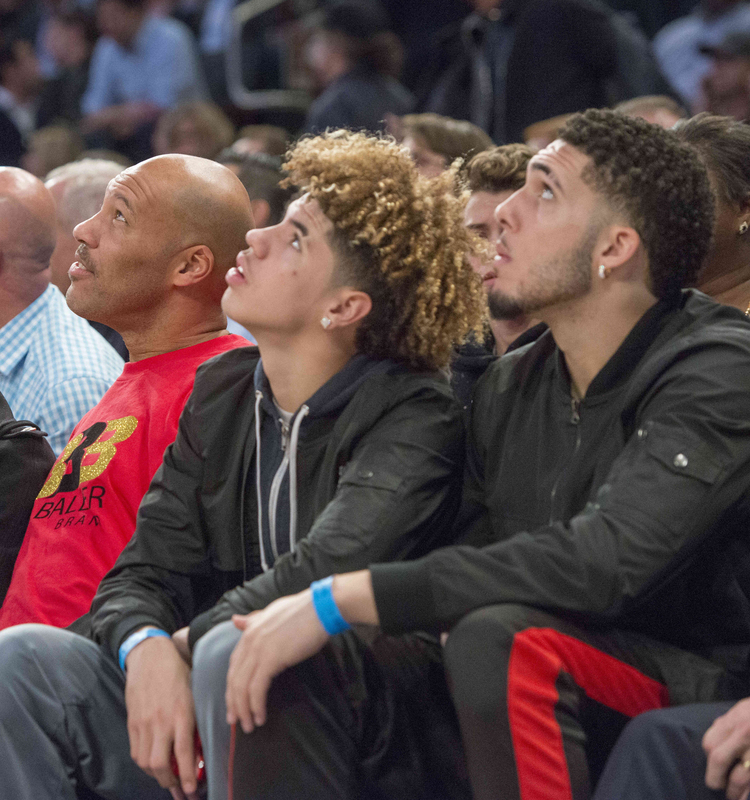 LaMelo’s eyes sparkled after Lonzo and the Los Angeles Lakers played the New York Knicks. He was still buzzing from sitting in the front row of Madison Square Garden, one of the world’s most famous arenas. “You could hear what the players were saying and everything,” he recalled with delight. Former NBA star Amar’e Stoudemire and film director Spike Lee stopped for bro hugs and dispensed words of encouragement. They appeared genuinely excited to meet him. LaMelo would introduce himself, but everyone acted like they already knew him. Just the previous morning he had signed a contract in his hotel suite in SoHo with Vytautas Prienai. He didn’t yet know how to say the club’s name and wasn’t exactly sure what town it was located in or what language they spoke. He had started collecting facts: It was cold, there would be less than six hours of daylight, he could still get pizza, his coach sold meat out of his car trunk. And he was about to see a lot more snow. He chuckled at horror stories of culture shock and descriptions of a backward place from Americans who had once played there. Former Wisconsin Badger Ben Brust said that when he’d order poultry he’d make chicken sounds. “I’d just go, ‘Bawk, bawk,’ ” said Brust. All of this seemed to amuse LaMelo. He knew he would be insulated from that. Whether it was a preternatural understanding or all part of LaVar’s meticulously absurd plan, he never seemed to be worried about anything. Reporters frequently ask him if he’s ever overwhelmed or nervous. Two months before LaVar Ball boomed his way onto the collective timelines of our lives, LaMelo with all his casual precociousness launched himself into the national basketball consciousness with an act of audacity and daring that is without rival. In December 2016, midway through a heavily attended Chino Hills game against Rancho Mirage, the prodigy appeared to become bored with sashaying his way past the defense for elegant floaters and flick-of-the-wrist 25-footers. LaMelo stood behind the 3-point line while teammate Eli Scott was at the foul line. Scott drilled the first, and as LaMelo stepped forward to dap Scott’s hand, he leaned in. 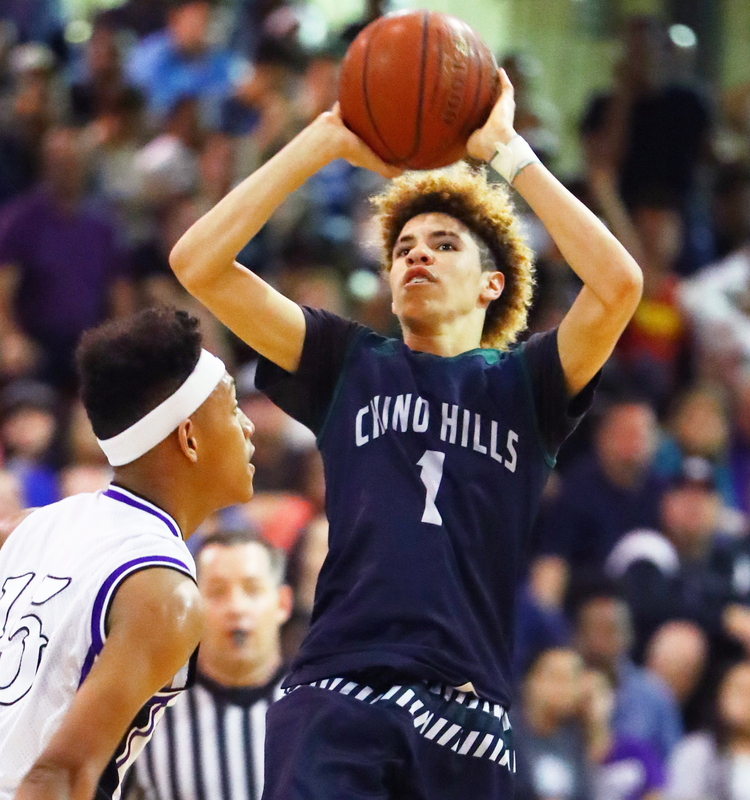 “Watch what happens on the next possession,” LaMelo said. Scott drilled the second, and Rancho quickly scored on the ensuing possession. After securing the inbounds pass, LaMelo slowly dribbled the ball back on offense, purposely letting everyone beat him down the floor. As he approached the midcourt logo, he pointed to the halfcourt line, stopped and casually pulled up several inches in front of it and let fly a 45-foot rainbow with 33 seconds left on the shot clock that ripped through the net. The moment immediately went viral, and thus began a wave of national buzz. Ball Is Life tweeted the clip, which garnered nearly 20,000 likes, officially making it the Ball family’s first viral moment. NBA players watched it on their smartphones the next day at practice. Curry was asked about the shot at a postgame news conference. From there his daring would continue unabated when he scored a school-record 92 points, including 41 in the fourth quarter, against Los Osos on Feb. 7, 2017, which had the global basketball community buzzing. His name trended on Twitter for the first time. SportsCenter led with it. The initial reaction was one of amazement, as people marveled over the eye-popping numbers and were puzzled how a player so young could pull off such a feat. A detailed breakdown of every bucket of LaMelo’s performance by YouTube account Baller Visions shows that he scored 70 “legitimate” points in halfcourt, transition or from the free-throw line, with 22 coming by way of cherry-picking. The shot stuck, and he began shooting with two hands from all over the floor. He quickly found he could control the ball better and release it quicker with two hands. A quirk that was once criticized by youth coaches and scouts quickly went from flaw to unfair advantage, allowing him to hit from absurd ranges with minimal effort despite his lack of proficiency in the weight room. His spindly limbs and narrow chest have him struggling to bench 115 pounds. The shot has several release points depending on distance or proximity of the defender. The odd trait spawned his viral success, helped him lead Chino Hills to a 65-3 record (26 points per game as a sophomore) and made him a five-star recruit and the No. 7 point guard in ESPN’s Class of 2019. But combined with a permanent green light — it’s all he’s ever known — his Jedi range, when not used properly, can often lead to ultra-low shooting percentages and mind-bogglingly bad shots. There are entirely new challenges in Lithuania, like guarding the pick-and-roll, something he never experienced in his two years at Chino Hills. Smashing into picks from players twice his size and age leads to little benefit. His seeming lack of aggressiveness accentuates the reputation that he’s all offense. To make up for his slight build he swipes for steals from the front and back. It requires a gambler’s mentality. The rewards are spectacular — making him an open court wonder. But the losses lead to easy buckets for the opposition. At 16, trying to find his way, LaMelo must decide between his perpetual heat check mindset and what his coaches ask of him. It is a strange proposition. LaMelo’s bound by the strictures of his coach Seskus, a fiery old world tactician, who prefers exquisite ball movement to individual showmanship. His coaching has had little impact on the recklessness of his youngest charge. LaVar’s presence is never far and has Seskus hamstrung. While his crossovers and no-looks go viral stateside, LaMelo is averaging just 7.6 points per game on 30 percent shooting and 2.6 assists in seven minutes per game for Vytautas. He averaged 25.6 points and 8.1 assists in the exhibition BBB Challenge. The plan is for LaMelo to play overseas until he’s eligible for the NBA draft in 2020. Like many kids his age, LaMelo subsists on four major food groups: Chipotle, Taco Bell, McDonald’s and Pizza Hut. In Lithuania he ingests familiar goodies such as Skittles, Haribo gummy bears and Pringles. When he’s not napping he’s devouring his latest obsession, the animated Netflix series Trollhunters, or passing the time ratcheting up the silliness during Instagram chats with close friends in which they discuss vital subjects such as social media faux pas, friends who regret cutting their hair and the virtues of blue Jolly Ranchers. Sparkling apple cider and syrup on his eggs are reminders of home. He takes selfies with his 6-week-old Rottweiler puppy, Dip, and tweets about how much he misses him. Apart from his smartphone, oversize smoothies are his most constant accoutrement. Lonzo is a frequent target of his digs, and many come while he’s playing with the Warriors on NBA 2K18 as he uses his favorite player, Durant, to make short work of his opponents. Particularly well-timed burns are punctuated with high-pitched shrieks and a burst of hyperactivity. A natural showoff, his resume includes diving off a second-story balcony into the family pool on a dare, orchestrating water balloon fights, getting under anyone’s skin who happens to be within arm’s reach, swearing at inappropriate moments and general rambunctiousness. While he got nearly straight A’s, LaMelo had little interest in going to school and would often be restless during class. In Room 201, LaMelo would park himself in the third row in the center of his first-period geography class. His attention could sometimes wander, but Ford, who also served as the football team’s defensive coordinator, used an unorthodox lesson plan to engage LaMelo. They would study how to read maps and immerse themselves in culture from places the students had never been. When a lesson focused on a specific country, Ford would order takeout from that region. “Melo would be early on those days,” said Ford. The 15-year-old was particularly intrigued by a story about Mansa Musa, a 13th-century West African Malian king who is thought to be the richest man who ever lived after his fortune, adjusted for inflation, topped $400 billion. “That got his attention,” Ford said with a chuckle. LaMelo peppered Ford with questions about wealth in Africa. Lonzo stood in the middle of the tunnel leading to the Friends and Family section at Staples Center. He leaned up against a wall as he spoke to LaVar, who often spent several minutes after each game breaking down his performance. LaMelo stood about 15 feet away, flanked by LiAngelo and Lonzo’s trainer Darren Moore, taking in the scene after a Lakers vs. Warriors clash in late November at the Staples Center. LaMelo is asked whether he’s ever met Curry, the player he’s often compared to, who had spoken so glowingly of him. “Nah, this my first time at a Warriors game,” he replied. As Lonzo listened intently to his father’s counsel, Curry walked up and stopped next to the pair. It was the first meeting between Curry and LaVar since he landed on the map nine months beforehand by claiming his eldest son was better than the two-time MVP. Curry extended a hand to Lonzo and shared several encouraging words. LaVar was humbled. His voice softened. Curry was the model for what his son could be. Curry and LaVar then embraced before exchanging knowing, sheepish smiles. They leaned in toward one another. LaVar’s right hand was on Curry’s shoulder. They hugged again and posed for a selfie. LaMelo focused on the scene. There was a lot to take in. Although he could not know it, a month from now he would shop for his first real winter clothes, wrestle with his puppy, Dip (which he didn’t yet own) one last time before heading to Los Angeles International Airport for a 4 p.m. flight bound for a place he’d never heard of. There his every move, miss, thought or tweet would spawn a dozen breathless reports. In seat 2C he would tuck in his earbuds and slip on a Dodgers neck pillow. He would watch the oceans and clouds float by, not really knowing what awaited on the other side. As Curry walked back out to the arena, he noticed LaMelo and made a beeline for him, again extending his hand to dap. With that, Curry was gone in a flash. LaMelo stood expressionless, trying to take in the encounter. He didn’t say a word. A small smile came to his face. He looked down trying to conceal it before it blossomed from ear to ear. For a moment, an ordinary kid.